The article "The spin evolution of fast-rotating, magnetized super-chandrasekhar white dwarfs in the aftermath of white dwarf mergers" by L. Becerra, J. A. Rueda, P. Lorén-Aguilar and E. Garcìa - Berro has been published on April 25 2018 in the Astrophysical Journal. The paper deals with the evolution of the remnant of the merger of two white dwarfs – a hot topic in astrophysics. The post-merger evolution of a super-Chandrasekhar magnetized white dwarf is computed taking into account all the relevant physical processes. These include magnetic torques acting on the star, accretion from the Keplerian disk, the threading of the magnetic field lines through the disk, and the thermal evolution of the white dwarf core. The main finding is that the central remnant can reach the conditions suitable to develop a thermonuclear explosion before other instabilities (such as the inverse beta-decay instability or the secular axisymmetric instability) are reached, which would instead lead to gravitational collapse of the magnetized remnant. 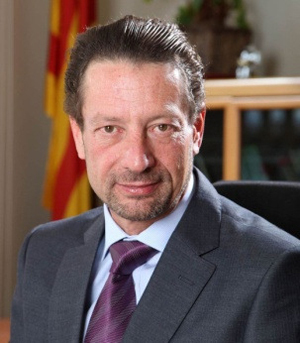 During this long process our friend and colleague, Enrique García-Berro, one of the coauthors of the article, has sadly passed away after a tragic accident in Spain: this is why this work is dedicated to his memory. Professor Stephen Hawking has died on March 14, 2018, at the age of 76. The iconic physicist was one of the greatest scientific minds in the history of the world, and worked to peer into the most mysterious parts of the universe. Born in Oxford on 8 January 1942, he attended Oxford University before moving onto Cambridge. From 1979 to 2009, he was Lucasian Professor of Mathematics at Cambridge – a post once held by Sir Isaac Newton, and became, later, director of research in the university's Department of Applied Mathematics and Theoretical Physics. 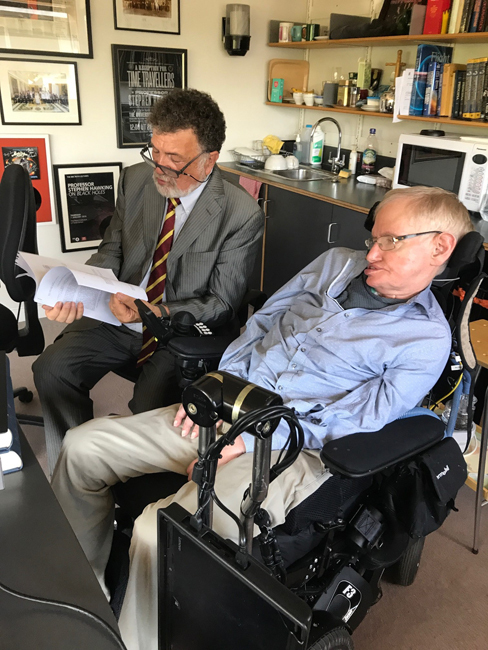 Hawking shot to international fame after the 1988 publication of A Brief History of Time, one of the most complex books ever to achieve mass appeal. "My goal is simple," Hawking once said. "It is complete understanding of the universe: why it is as it is, and why it exists at all." He spent much of his career trying to find a way to reconcile Einstein's theory with quantum physics, and produce a "Theory of Everything". His work ranged from the origins of the universe itself, through the possibility of time travel to the mysteries of space's all-consuming black holes. His most famous theoretical breakthrough was the idea that black holes are not really black, but can produce thermal radiation and potentially "evaporate". Scientists refer to such potential emanations as "Hawking radiation". 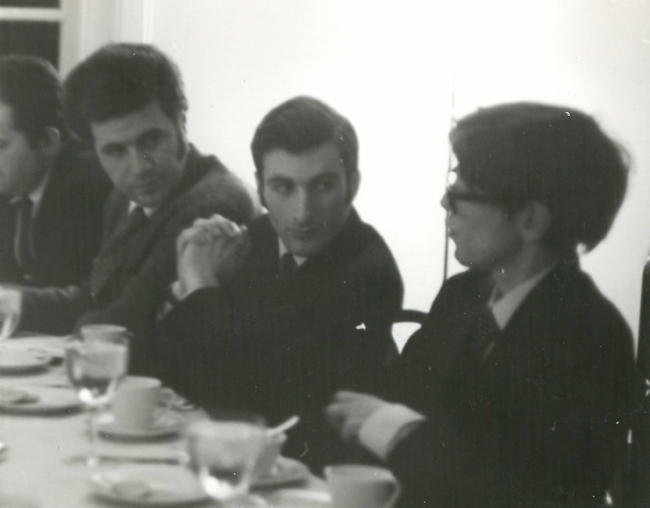 Professor Ruffini, Director of ICRANet, was a close friend of him, since their university studies. 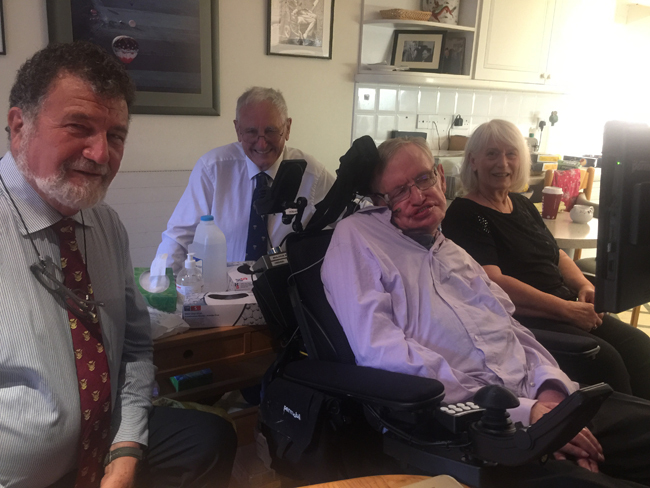 They joined numerous research activities and publications, and Professor Ruffini was also invited by Prof. Hawking to have dinner together in his apartment in Cambridge, last year at the presence of the Crafoord Price Roy Kerr. 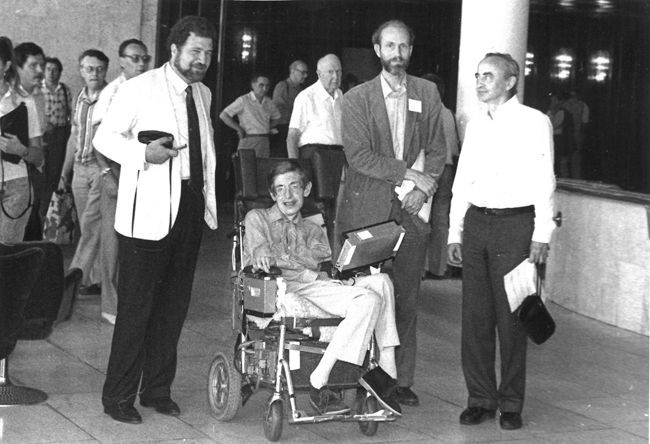 Professor Hawking had also a Public Lecture in the last Marcel Grossmann edition (MG14), held in Rome from 12 to18 July 2015 (https://www.youtube.com/watch?v=bvyIRqhY8iA&feature=youtu.be). 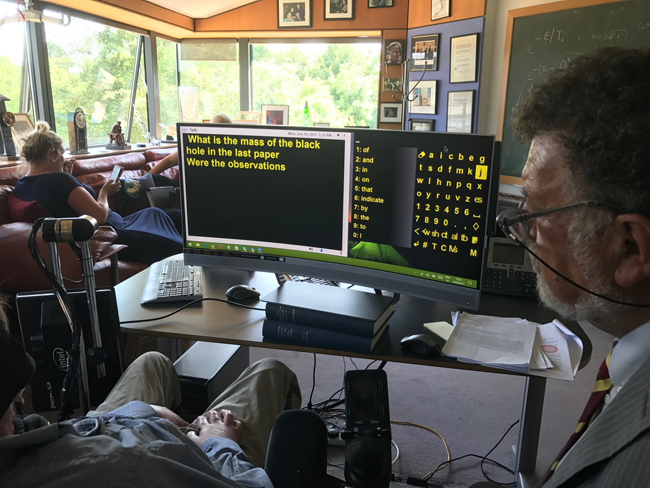 To see and read all the interviews Professor Ruffini released after Stephen Hawking death, click here. 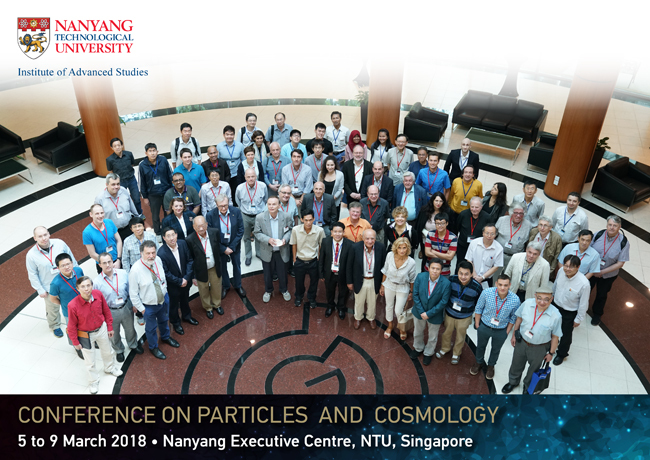 On March 4 - 10, 2018, Prof. Ruffini, Director of ICRANet, visited Singapore and joined the "Conference on Particles and Cosmology", held at the Nanyang Executive Centre (Nanyang Technological University NTU), from 5 to 9 March. In the framework of this conference, Professor Ruffini was invited to give an important talk on "Gamma Ray Bursts in fundamental physics and Cosmology". Details about the event can be found here. 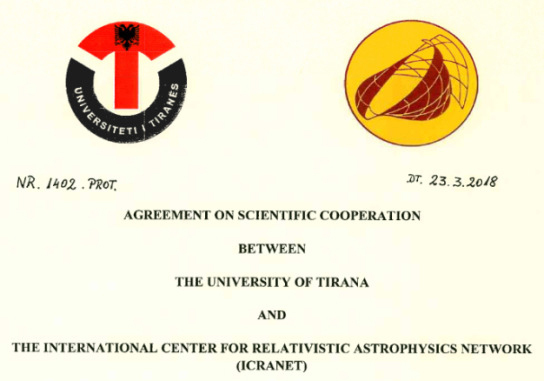 On the 23 March 2018, ICRANet signed a cooperation agreement with the Tirana University – Albania. 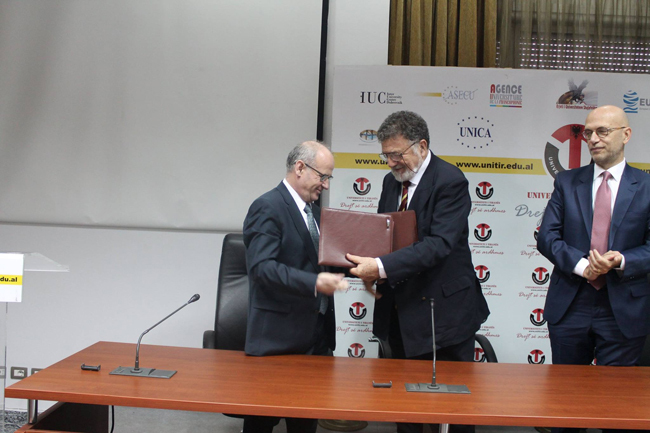 The document was signed by Dr Mynyr Koni, Rector of the University, and Prof. Ruffini, Director of ICRANet and will be valid for 5 years, starting from the date of its signature. The main joint activities to be developed under the framework of this agreement include: the promotion of theoretical and observational activities within the field of Relativistic Astrophysics; the institutional exchange of faculty members, researchers, post-doctorat fellows and students; the promotion of technological developments; the development of Data Centers for Astrophysical data in all wavebands; the organisation of seminars, conferences, workshops, training and research courses, and the development of inter-institutional research areas associated to local graduate programs; and joint publications. 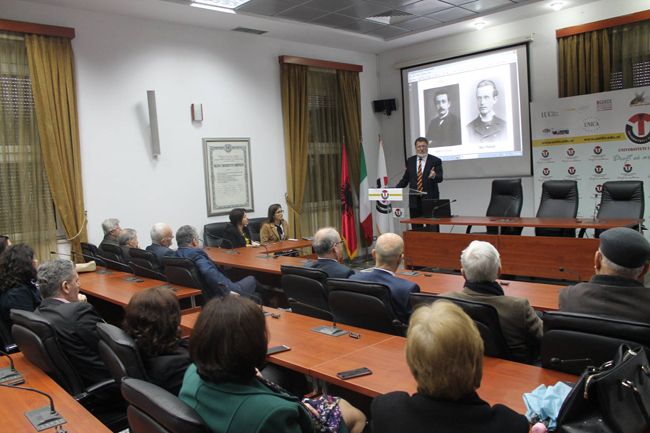 During his visit to Albania Professor Ruffini was accompanied by Professor Mimoza Hafizi, a close collaborator of ICRANet from the University of Tirana. After the Ceremony of Signature, Professor Ruffini gave an important talk "On the observation of the formation of a Black hole in a Gamma Ray burst ten billion years in our past light cone" in front of the university and faculty management, a group of students from the same institution, numerous academics as well as representatives of the government. To celebrate this special event, Professor Ruffini gave an interview at the Albanian Radio and Television TVSH (Radio Televizioni Shqiptar) in the morning emission "Good Morning Albania" (https://www.youtube.com/watch?v=tx94mQhYS7I&feature=youtu.be), and a second interview at News24 Television (https://www.youtube.com/watch?v=DWI3538SD2U). The Director of ICRANet reaffirmed his gratitude and satisfaction for visiting Albania and signing the collaboration agreement with one of its best Universities after almost 20 years of collaboration, mostly thank to the work of Professor Mimoza Hafizi. He also expressed his sincere hope that Albania will join the broader family of ICRANet member States and Institutions. More video and photos: here. The link to the agreement: here. From 24 to 26 March 2018, Professor Remo Ruffini, Director of ICRANet, flew to the United State, since he was invited to give an important seminar in Stanford University on the 26 of March. 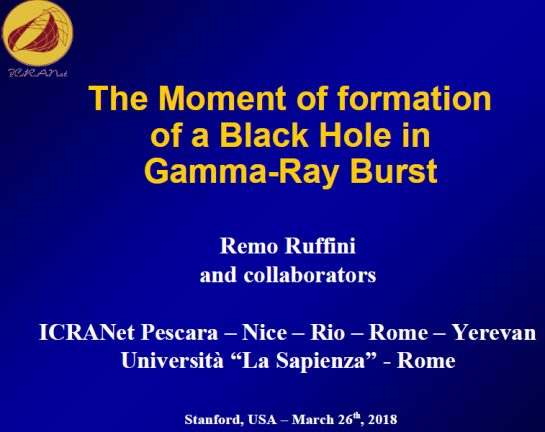 With this seminar, titled "The moment of Formation of a Black Hole in Gamma Ray Bursts", Professor Ruffini analyzed the fundamental role of LAT Observations by the FERMI satellite, in identifying the birth of a Black Hole (BH) in Binary Driven Hipernovae (BdHNe) and short-GRBs, leading to the measurement of the mass and spin off of the BH. 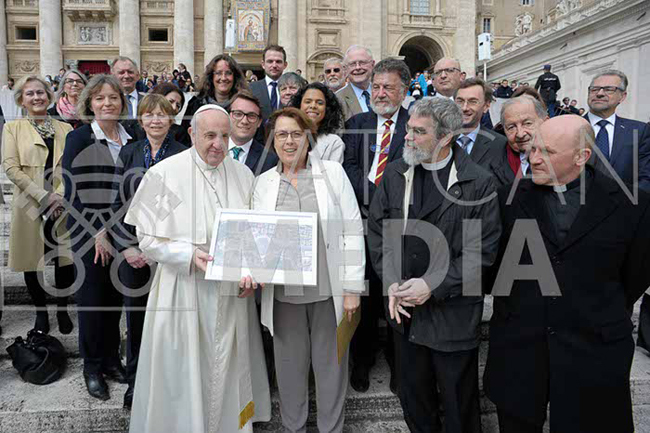 In preparation for UNISPACE+50, the first United Nations Global Space Summit of the 21st Century, to celebrate the fiftieth anniversary of the first United Nations Conference on the Exploration and Peaceful Uses of Outer Space, an exceptional seminar was held in Castel Gandolfo and Specola Vaticana on 27- 28 March 2018. The joint UNOOSA / Holy See Seminar on "Exploration and Development of Space Opportunities and Issues in the Context of the Sustainable Development Goals", was aimed to progress together with representatives of the Holy See and selected experts from different fields towards the United Nations Global Space Summit in June 2018. In this framework, Professor Ruffini was a keynote speaker in the session devoted to "Space as a Tool for Diplomacy and Peace", and presented to the audience his experience in international cooperation in space activities and in particular he insisted on the importance of open data access to everyone. 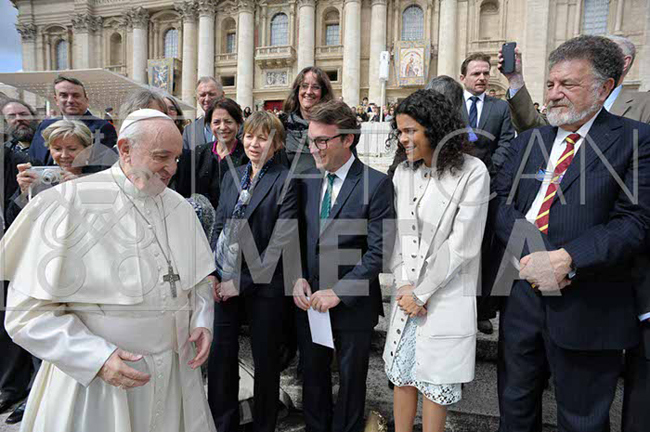 On the second day, all speakers of the seminar took part in the General Audience of Pope Francis and the Baciamano Special, an opportunity to individually greet the Pope. 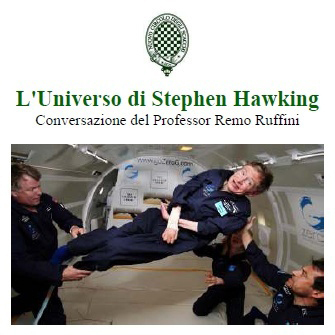 On Wednesday, April 11, 2018, Professor Ruffini, Director of ICRANet, delivered an important talk at Nuovo Circolo degli Scacchi in Rome, titled "The Mass-Energy Formula of Black Holes" in memory of his friend Stephen Hawking, with whom he joined numerous research activities and publications. Professor Ruffini also became an active member of Circolo degli Scacchi, and will join the group at least until the end of the summer. Fig. 1. Opening ceremony. From left to right: profs. Fortov, Kilin, Ruffini and Vereshchagin. 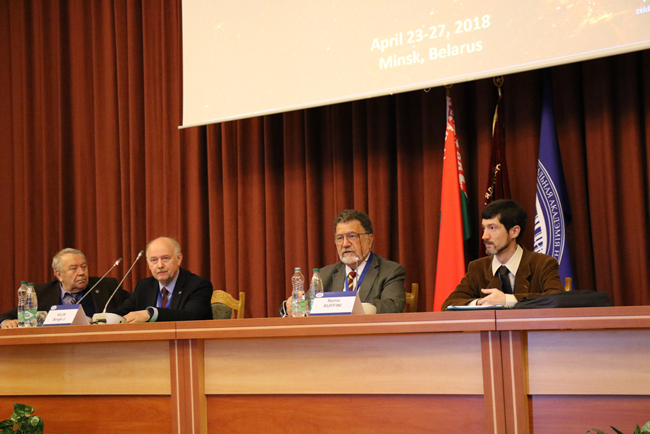 On April 23-27, 2018 an international conference "The Third Zeldovich meeting" was held at the National Academy of Sciences of Belarus in Minsk, Belarus. 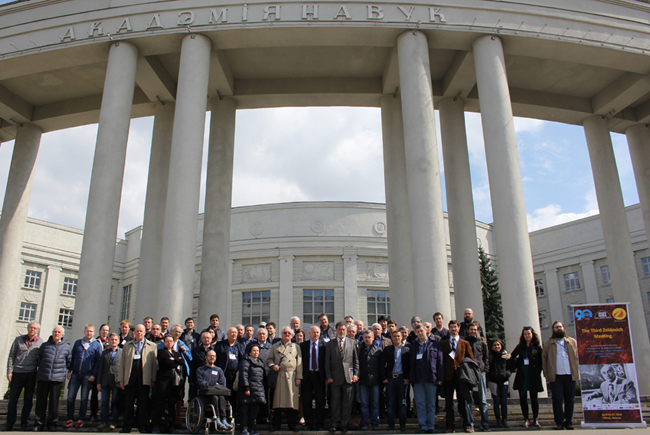 The conference was jointly organized by ICRANet and the National Academy of Sciences of Belarus The meeting was sponsored by these two organizations and by Central European Initiative (CEI). 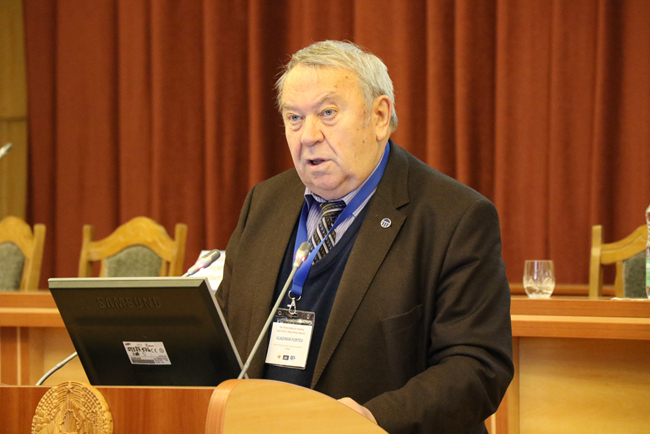 The opening address was given by the Deputy Chairman of the National Academy of Sciences of Belarus Academician Sergei Kilin and by Director of ICRANet Prof. Remo Ruffini. About 80 participants, nationals of Argentina, Armenia, Belarus, Bosnia and Herzegovina, China, Colombia, Germany, Hungary, Italy, Kazakhstan, Poland, Russia, Slovenia, Taiwan, Ukraine and other countries took part in the meeting. The conference covered many topics including cosmology, relativistic astrophysics, general relativity, elementary particle and nuclear physics, detonations and explosions. This celebration was the third international conference in Minsk dedicated to Ya. B. Zeldovich. The previous meetings were held on 20-23 of April 2009 and was organized jointly by ICRANet and Belarusian State University celebrating also the 2009 Year of Astronomy, and on March 11-14, 2014 celebrating 100th anniversary of Ya. B. Zeldovich. Fig. 2. Lecture of Prof. Vladimir Fortov. Important scientific developments were discussed at the conference. In particular, the concept of induced gravitational collapse leading to cosmic Gamma-Ray Bursts was presented in details. The role of dark energy in cosmological structure formation on different scales was extensively discussed. The conference has created a stimulating environment for further scientific exchange and contacts between scientists in the West, those coming from the great Russian school of Zeldovich, and local scientist from Belarus. During the meeting agreement was reached between ICRANet and the Editorial Board of the journal Astronomy Reports to publish proceedings of the conference as regular papers. It is expected that this conference series in Minsk celebrating Ya.B. Zeldovich will continue. Fig. 3. 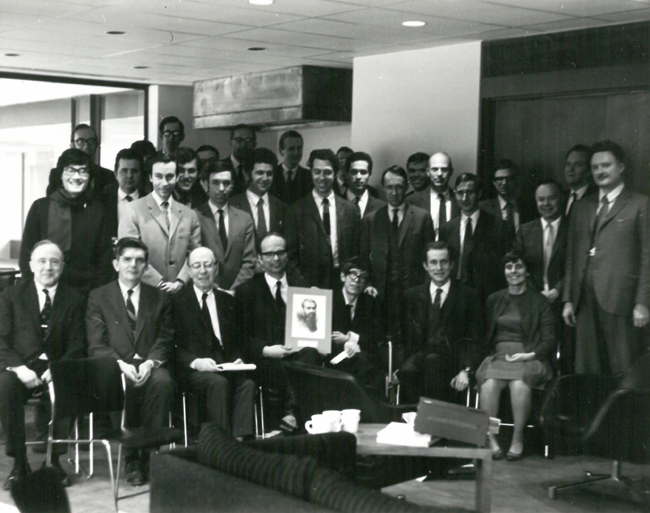 Group photo of participants of the Third Zeldovich meeting. During the meeting important meetings took place, in particular the discussion between the delegation from ICRANet and the Ministry of Foreign Affairs of Belarus about the adhesion of Belarus to ICRANet, see http://mfa.gov.by/en/press/news_mfa/fd4a7f5e32424fda.html. Also a Memorandum of Understanding was signed between the National Research Nuclear University MEPhI and the National Academy of Sciences of Belarus. The website of the meeting: http://www.icranet.org/zeldovich3, it contains relevant information, including scientific program, social program, international and local organizing committees, official conference photos, poster, abstract booklet, participants list, information about proceedings and other information. On-line registration for the 15th Marcel Grossmann Meeting, to be held from 1 to 7 July 2018 at “La Sapienza” University in Rome, is open. The deadline for oral communications and poster presentations has been extended up to 30 of May 2018. Belinski, V. A., Vereshchagin, G. V., "On the cosmological gravitational waves and cosmological distances", published in Physics Letters B, Volume 778 on 10 March 2018. We show that solitonic cosmological gravitational waves propagated through the Friedmann universe and generated by the inhomogeneities of the gravitational field near the Big Bang can be responsible for increase of cosmological distances. Christian Cherubini, Simonetta Filippi, Alessandro Loppini, Rahim Moradi, Remo Ruffini, Yu Wang, and She-Sheng Xue, "Perfect relativistic magnetohydrodynamics around black holes in horizon penetrating coordinates", published on Physical Review D 97, 064038 on 28 March 2018. Plasma accreting processes on black holes represent a central problem for relativistic astrophysics. In this context, here we specifically revisit the classical Ruffini-Wilson work developed for analytically modeling via geodesic equations the accretion of perfect magnetized plasma on a rotating Kerr black hole. Introducing the horizon penetrating coordinates found by Doran 25 years later, we revisit the entire approach studying Maxwell invariants, electric and magnetic fields, volumetric charge density and electromagnetic total energy. We finally discuss the physical implications of this analysis. L. Becerra, J. A. Rueda, P. Lorén-Aguilar, and E. García-Berro, "The Spin Evolution of Fast-rotating, Magnetized Super-Chandrasekhar White Dwarfs in the Aftermath of White Dwarf Mergers", published on The Astrophysical Journal, Volume 857, Number 2, on 25 April 2018. The evolution of the remnant of the merger of two white dwarfs is still an open problem. Furthermore, few studies have addressed the case in which the remnant is a magnetic white dwarf with a mass larger than the Chandrasekhar limiting mass. Angular momentum losses might bring the remnant of the merger to the physical conditions suitable for developing a thermonuclear explosion. Alternatively, the remnant may be prone to gravitational or rotational instabilities, depending on the initial conditions reached after the coalescence. Dipole magnetic braking is one of the mechanisms that can drive such losses of angular momentum. However, the timescale on which these losses occur depend on several parameters, like the strength of the magnetic field. In addition, the coalescence leaves a surrounding Keplerian disk that can be accreted by the newly formed white dwarf. Here we compute the post-merger evolution of a super-Chandrasekhar magnetized white dwarf taking into account all the relevant physical processes. These include magnetic torques acting on the star, accretion from the Keplerian disk, the threading of the magnetic field lines through the disk, as well as the thermal evolution of the white dwarf core. We find that the central remnant can reach the conditions suitable to develop a thermonuclear explosion before other instabilities (such as the inverse beta-decay instability or the secular axisymmetric instability) are reached, which would instead lead to gravitational collapse of the magnetized remnant. R. Ruffini, J. Rodriguez, M. Muccino, J. A. Rueda, Y. Aimuratov, U. Barres de Almeida, L. Becerra, C. L. Bianco, C. Cherubini, S. Filippi, D. Gizzi, M. Kovacevic, R. Moradi, F. G. Oliveira, G. B. Pisani, Y. Wang, “On the rate and on the gravitational wave emission of short and long GRBs”, accepted for publication in The Astrophysical Journal, on April 6, 2018. On the ground of the large number of gamma-ray bursts (GRBs) detected with cosmological redshift, we classified GRBs in seven subclasses, all with binary progenitors originating gravitational waves (GWs). Each binary is composed by combinations of carbon-oxygen cores (CO core), neutron stars (NSs), black holes (BHs) and white dwarfs (WDs). The long bursts, traditionally assumed to originate from a BH with an ultra-relativistic jetted emission, not emitting GWs, have been subclassified as (I) X-ray flashes (XRFs), (II) binary-driven hypernovae (BdHNe), and (III) BH-supernovae (BH-SNe). They are framed within the induced gravitational collapse (IGC) paradigm with progenitor a CO core-NS/BH binary. The supernova (SN) explosion of the CO core triggers an accretion process onto the NS/BH. If the accretion does not lead the NS to its critical mass, an XRF occurs, while when the BH is present or formed by accretion, a BdHN occurs. When the binaries are not disrupted, XRFs lead to NS-NS and BdHNe lead to NS-BH. The short bursts, originating in NS-NS, are subclassified as (IV) short gamma-ray flashes (S-GRFs) and (V) short GRBs (S-GRBs), the latter when a BH is formed. There are (VI) ultra-short GRBs (U-GRBs) and (VII) gamma-ray flashes (GRFs), respectively formed in NS-BH and NS-WD. We use the occurrence rate and GW emission of these subclasses to assess their detectability by Advanced LIGO-Virgo, eLISA, and resonant bars. We discuss the consequences of our results in view of the announcement of the LIGO-Virgo Collaboration of the source GW 170817 as being originated by a NS-NS.